The super affordable, LEGO compatible, programmable robot just got better with the release of version 2.0. The Edison Robot Kit is your stepping stone into the exciting world of science and technology! Were about to do a trip around Oz for a year with our 8 yo twins, so wanted some robots to teach them coding, STEM and have some fun with. Edisons looked like great value, so got the kit with 2 Edisons, expansion and 2 maps. Had some initial problems reading bar codes, but CD-Soft help were great and some updated firmware has sorted it out. Great value and product - I like the fact that they can be used with and without Lego, and have different levels of programming that can advance with the kids. Also lots of existing instructions/workbooks/exercises. Precision Driving - Edison V2.0 has wheel encoders. Wheel encoders allow Edison to travel specific distances at exact speeds. Think of it as cruise control. Edison can now also turn to specific angles (using EdPyApp.com) and drive straight – VERY straight. Clutch mechanism - Edison V2.0 has a clutch in each gear box that prevents damage to the gears if the wheels are forced around. This means Edison V2.0 is even tougher. More programming options - Edison’s graphical programming software, EdWare is getting some friends. Meet EdPy, EdBlocks & EdScratch. EdBlocks is a super simple graphical programming language for introducing younger students to programming. EdBlocks is based on Scratch Blocks created by the MIT Media Lab and Google. Check it out here www.edblocksapp.com. 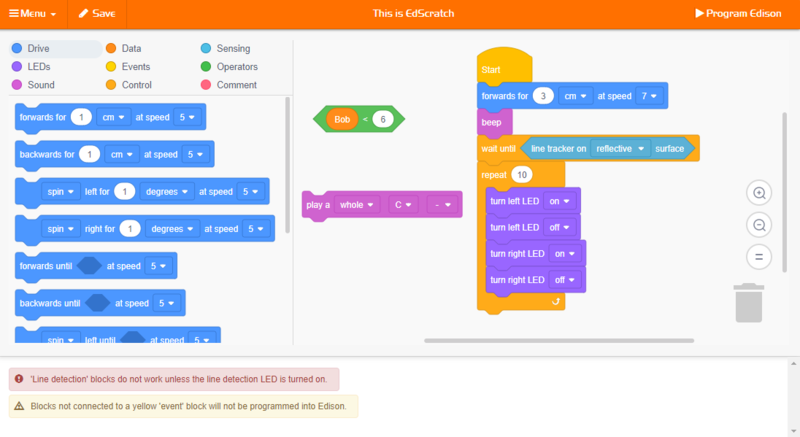 NEW EdScratch is a vertical drag-and-drop block-based system that has been developed using the Scratch Blocks code base developed by the MIT Media Lab from the Blockly code base developed by Google. Check it out here www.edscratchapp.com. EdPy is a Python based programming environment for Edison. It’s FREE, online and the best way we can think of to introduce students to a written programming language. 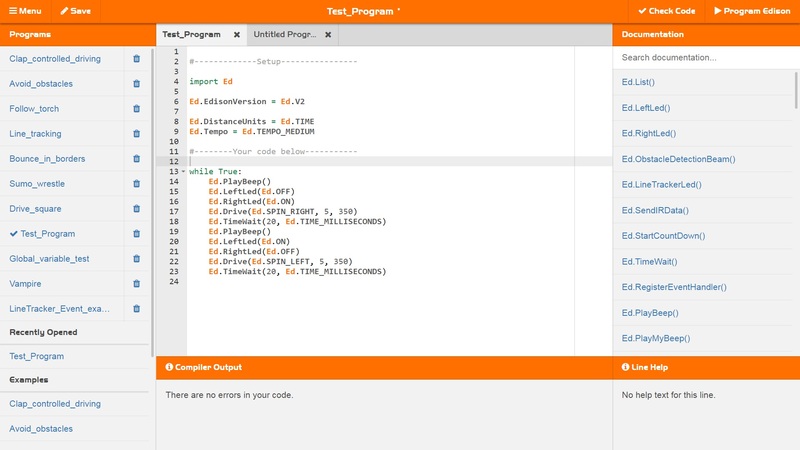 Students can now write programs in Python and see their code come to life in Edison. Check it out here www.edpyapp.com. Edison Robot is for students of all ages. You can learn computer programming just like other robotics systems which can cost much, much more. Edison is a great resource for teachers as classroom sets are now very affordable for schools – it’s now possible to have one robot per student. Edison is the perfect teaching and learning robot for Science, Technology, Engineering and Mathematics (STEM) activities! 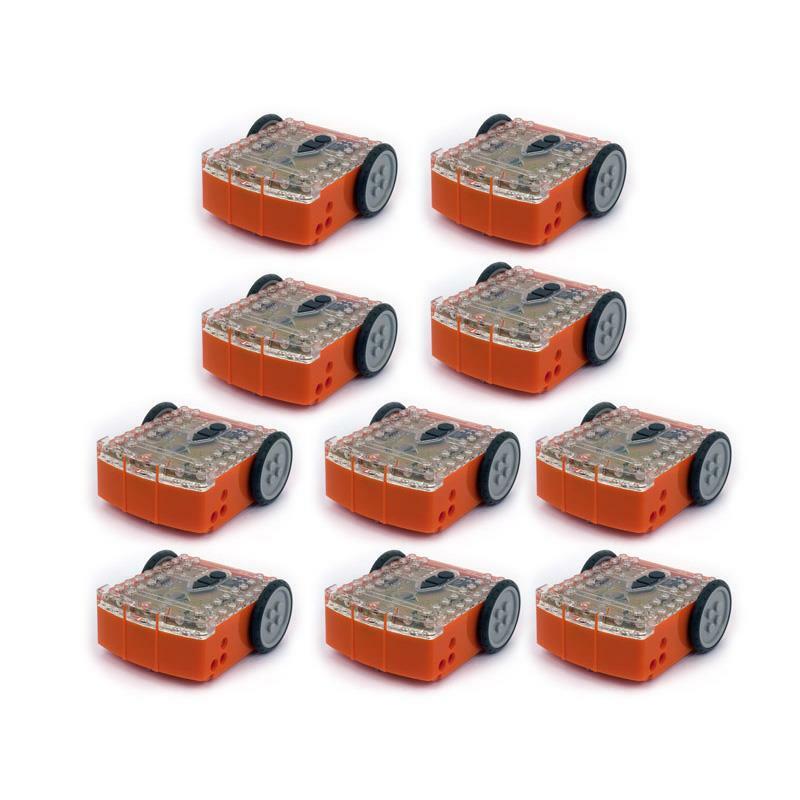 Communicate with another Edison using infrared light – robot swarm anyone?!! EdScratch is available online with no installation, no driver software and as always FREE! Just plug your Edison in and start programming! Lesson Activities - The complete set of 6 units with 240 pages of lessons & activities. Teacher's Guide - This guide provides an overview and supporting information for all of the EdScratch units, lessons & activities. Warning Message Guide - Helps debug your code. This page includes all the warning messages that can be displayed in the bug box of the EdScratch language app, along with an explanation and how to fix them. The EdBlock App uses block based code to make programming your edison a breeze. 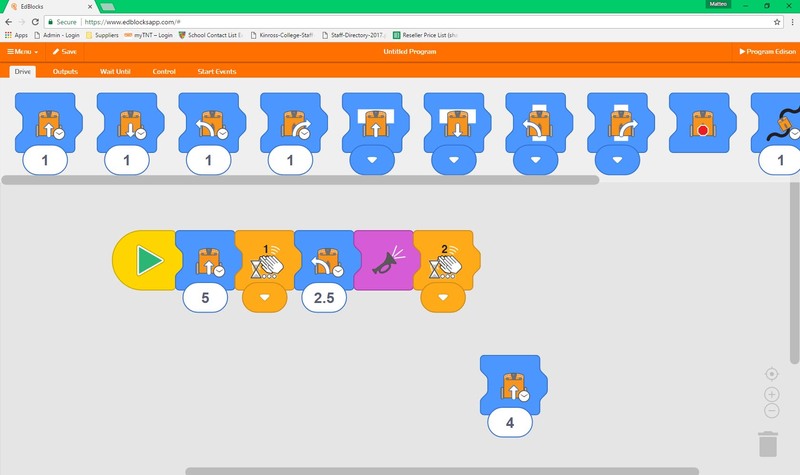 The block code programming language uses DRIVE, OUTPUTS, WAIT UNTIL, CONTROL and START EVENTS that easily connect together like a puzzle. EdBlock is available online, just like the EdWare software there is no installation, no driver software and is completely FREE. EdPy is based on Python, a popular computer programming language renowned for being easy-to-learn with high readability. With EdPy, students are learning the core of a real programming language and are able to take their exploration of robotics and coding to a more advanced level. EdPy is available online with no installation, no driver software and is completely FREE. As you may be aware, EdWare was the original programming language for the Edison robot. With the release of EdScratch (along with our other programming languages EdBlocks and EdPy), EdWare is now being retired. EdBook 1 You're a controller. EdBook 2 You're a Programmer. EdBook 3 You're a Builder. Lessons plans links to the Australian curriculum. 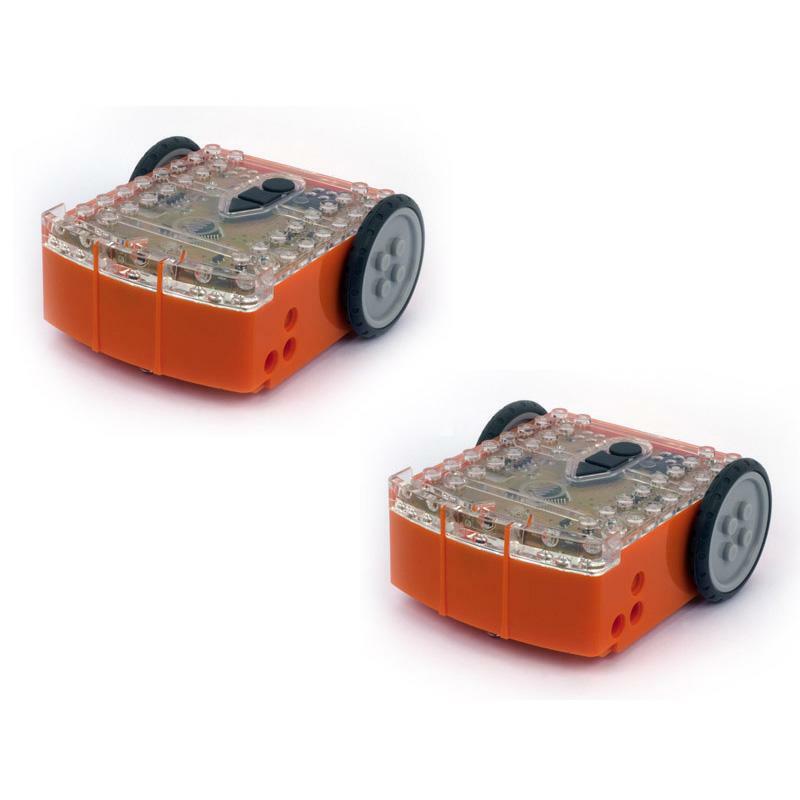 I recently bought 2x Edison programmable robots to share between my children 6, 8 and nearly 10 years of age. My hopes were to incorporate this robot into homework/tech time on a daily basis, break the monotony of pen and paper learning and bridge the technology/real life connection to show my children how they can apply knowledge to create and solve real world problems. My children were introduced to programmable robots through small school experiences and our local library which offered Game on Robotics lessons during the school holidays. These fantastic lesson formats included the use of Blue bots, Ozobots and Pepper the humanoid Robot. Needless to say my children were highly engaged and catered for their range of ages and capabilities. Met my list of important features and is compatible with Lego. After sales service was helpful, friendly and understanding of associated concerns. Thank you for the opportunity to review this product. After my first experience with the Edison Robot Kit V2.0 I was very impressed at how easy is was to use with the students of all ages. I have since even observed a four-year-old able to transfer the code independently to the Edison Robot! As a teacher this means more time to facilitate effective question and discussion as students work on their projects instead of fielding technical issues. I loved seeing how students could work so independently with the Edison Robot. It built their confidence in coding, allowed students to develop and demonstrate critical thinking, problem solving and generated high volumes of constructive discussion amongst the students. I can see the Edison Robot being easy to manage in the classroom environment with only requiring the Edison Robot kit, including the transfer cord and Edison robot, along with any electronic device with an audio jack. Being Lego compatible the students can engage in STEM projects using materials that so many students are familiar with. We all enjoyed planning and then building Lego parts that easily attached to the top of the Edison Robot allowing it perform functions e.g. delivering books, mobile advertising and being programmed to draw. The Edison Robot can be programmed by students using the free online coding programs whether it be the Scratch EdBlocks or the more complex written coding language Python using EdPy. The students I was working with used the EdBlocks however the different level of programming skills required by the other programs simply allows for needs of a greater diversity of students be met with the Edison Robot. 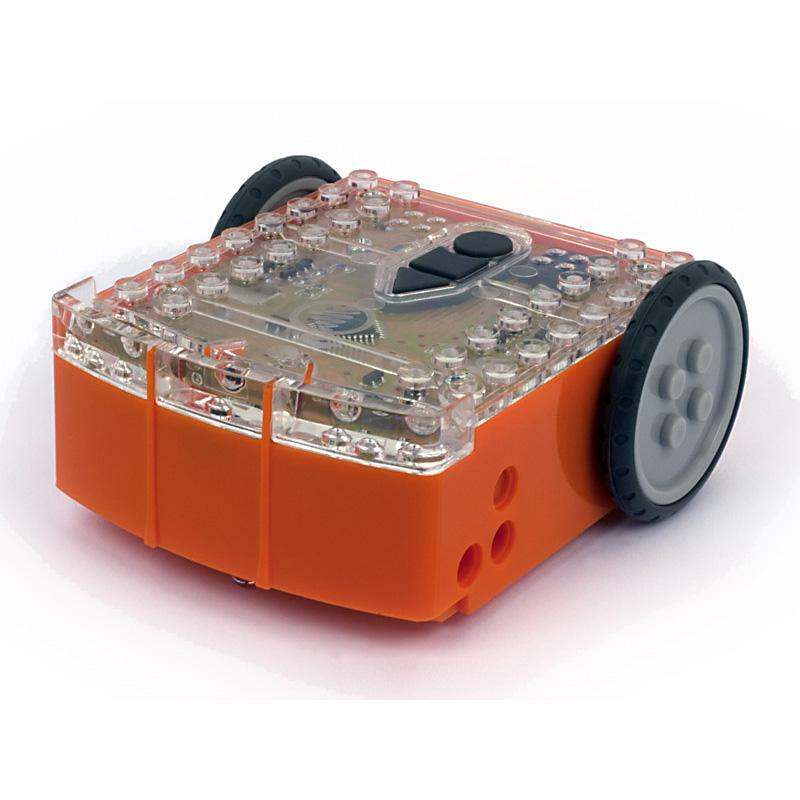 The Edison Robot, from Microbric in South Australia, gets a strong recommendation from myself as the tool to bring about meaningful STEM activities in your classroom.